This post is in exchange for goods received from Collage.com, Inc.. Affiliate links included.All opinions are my own. 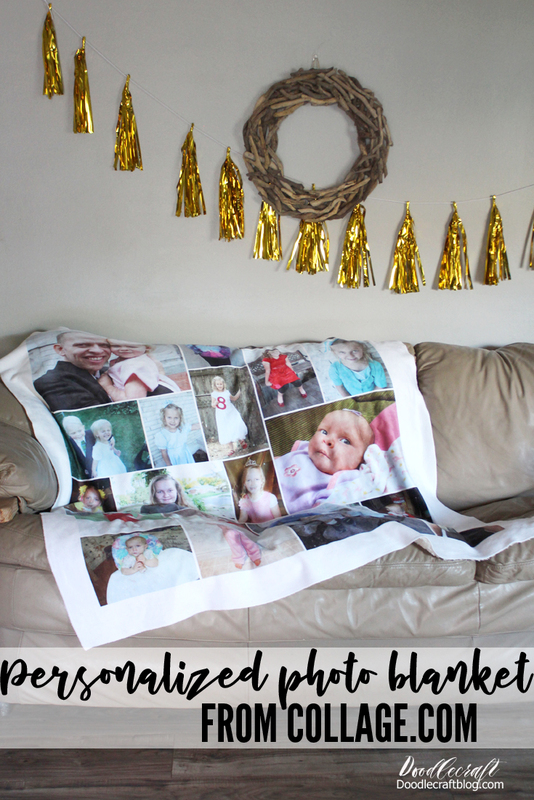 Personalized Sherpa photo blanket starting at $80, including free shipping from Collage.com, Inc.
You guys, shhhhh! This is a surprise gift for my daughter for Christmas. Do you think she will read my blog and see this? Nevertheless, I have to show you how amazing this turned out in plenty of time for you to get your own! Enter the giveaway at the end of this post! Christmas time is family time and we love reminiscing the past and planning the future. We love looking at photographs and feeling nostalgic...plus, it gets cold here and one can never have too many blankets...especially if they are this cute! I am so excited to be partnering with Collage.com, Inc. today for this cool personalized gift idea. I received a Sherpa throw sherpa photo blanket starting at $80, including free shipping for this post. The Sherpa is soft and fluffy while the photo side is still incredibly plush--but the photo's are very vivid and sharp. The process for making this blanket was a breeze! I had 20 photos selected that I just love. You can use one photo (make sure it is high resolution for best results) or tons! My blanket of 20 feels perfect. Just click the "upload photos" button and load in all your photos. Then, like MAGIC, Collage.com, Inc. will arrange the pictures in a perfect layout. At this point you can move things around and switch the pictures place and size. If you notice a photo or two looking a little dark or in need of editing, just select the image and select the edit button. Then lighten, brighten, add frames, stickers, or more! Once satisfied with the images, click the "add to cart" button! Boom, entire thoughtful, personalized and wonderful gift made in minutes! Now it takes a week or so and the sherpa photo blanket starting at $80, including free shipping arrives well packages and perfect. I cannot wait until my daughter sees it on Christmas! It's pretty fun to have all these memories in one place. If the blanket is wrinkled, it can warp the pictures slightly which can be rather hilarious! Hours of fun snuggling with this blanket. I can see my daughter taking this off to college with her to always remember her worth and value. I love personalized and meaningful gifts. Is there someone on your list that is hard to shop for or has everything? This is the perfect solution! Trust me, grandma and grandpa need a blanket like this! What would you fill your sherpa photo blanket starting at $80, including free shipping with? Maybe a fun vacation...maybe all the kids...maybe family pictures...this blanket will become an heirloom! I would want it for myself! I'd love a collage blanket featuring pictures of my 4 kids. I would make it for me, but a cat would still sit on it. I would like it for myself and put family photos on it! I would make it for my parents of my kids as a christmas gift. Honestly I would put all our favorite outdoor moments on it. All our hunts and hikes and fishing trips. That would be amazing! Plus Nat, yours looks amazing and I remember so many of those cute little photos! I want to make one for us of our kids. I would make it for the grandparents. I want to make one for my are my parents as a Christmas or anniversary gift. My sister in law made one for her parents and it is awesome! I'd like to make one for my parents as well. This is such a great idea! Great for the upcoming holidays! I would make it for myself with my grand kids on it. I would make it for myself. I'm not sure what I'd put on it yet. I would make it for my son and daughter-in-law with photos of their one month old daughter on it. I would make it for our oldest daughter.